Oh! Hello! Long time no see. Recently, I got alot of things to do, so busy that my brain is trying to shut itself down. Well, thats not true. Oh, and did you notice the little change on this blog? I had added video, pictures and more! Well, I will try to add more if I could. Tsukune Aono is a normal high school freshman who is unable to get into any private school due to his poor grades. His parents soon enroll him to Yōkai Academy, which, upon arriving, turns out to be a secret school for supernatural monsters and mythological creatures disguised as humans. Tsukune quickly realizes his admission into Yōkai Academy must have been a mistake and fears for his life. He quickly becomes friends with the beautiful Moka Akashiya( so moe! ), who turns out to be a vampire attracted to the sweet taste of his blood. While at first Moka was upset upon discovering Tsukune's human identity, she realizes that he is the first real friend she had ever made. 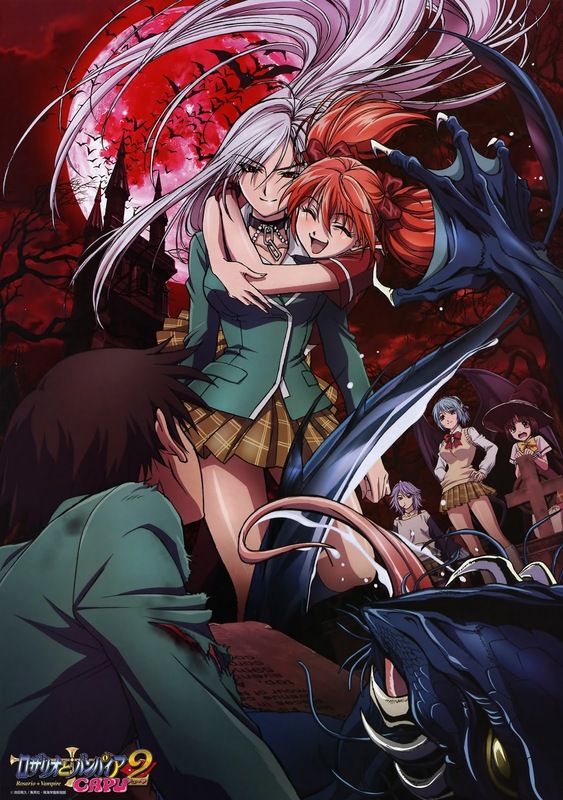 Despite Moka's vampiric nature, she is a kind girl and Tsukune quickly falls for her, and ultimately decides to stay at Yōkai Academy despite the various dangers while hiding his human identity from the faculty and other students. Tsukune soon discovers that when he removes the rosary around Moka's neck, she transforms into her true vampire form (her true personality is sealed, the kind Moka being an artificial persona, sad isn't it? ), being stronger and more powerful than almost any other creature at the school, and Tsukune is the only person who can physically remove it to transform her. 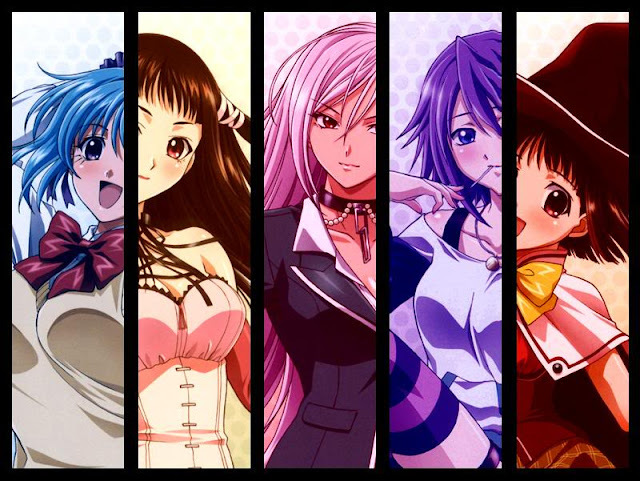 However, "Inner Moka" has an entirely different, often cold and merciless, personality, thus the rosary is only removed in dire emergencies ( but it is later revealed thet she too, had an affection towards him, lucky strike...). Well, that is so much for the first season. Oh, the second season is about their life, again, at the Yōkai Academy. But this time, Moka younger sister is introduced, putting the spice in this anime ( which remind me, there are an episode about a teacher that makes curry and turn everyone in the school into yellow curry zombie. Good curry need good spice, you know). The story is more action packed, not to mention with intense love rivalry and a lots of comedy. 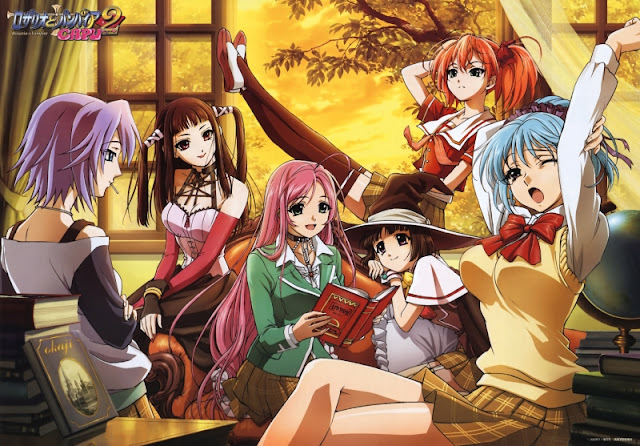 Tsukune is forced to choose who that will become his only girlfriend, especially when the girl's parents start to join them, in the fight for true love. Nevertheless, this is a damn good anime, highly recommended to the one who love supernatural and love comedy. I always envy the main character in every harem anime, especially this one. Where again you can see a bunch of good looking (monster) girls that always try to seduce you in? If there is, tell me! Heheh, just kidding (or not). I'm still looking foward to a monster or ghost anime that is fun to watch..... And I think I got it..... Until next time, chow!